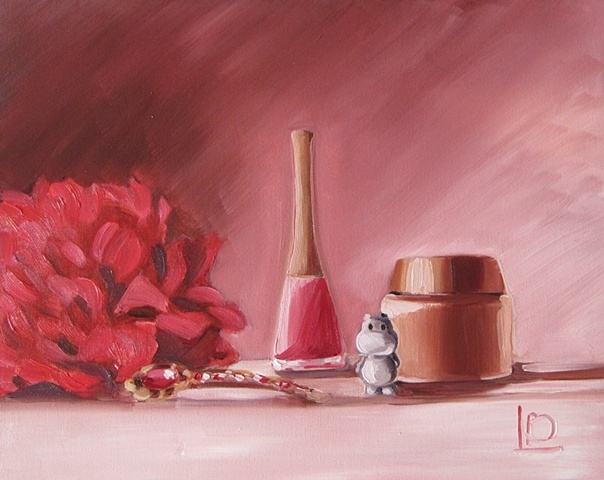 I like the idea of a bit of wit in my paintings, and this still life is an example. A collection of feminine objects- a flower, a bejewelled hair clip, a pot of moisturiser and a bottle of my favourite nail polish sit alongside a cute little hippo charm. The warm reds and golds make this a great painting for a bedroom- you could frame it, or just prop it on a shelf or dressing table.